The body parts of the Wave Cajons are made of a new composite material consisting of wood and plastic. This gives the cajon an exceptional strength that influences the sound significantly. Only playing surfaces are used, that suit the body material perfectly in terms of sound and design. The rich distinctive bass and the extremely sensitive response of the snare sound result in a sensational instrument that is unprecedented. The look of the Wave Cajon changes depending on the light incidence in ever-exciting variations. The surface is non-slip, so no additional cajon pad is needed. The transversal grooves structure of the side parts even allows güiro and washboard like playing techniques. Dimensions: approx. 47 x 30 x 30 cm Special Coated 15 mm birch body, 11 layers Handpicked Sela Thin Splash playing surface Exchangeable playing surface Solid, rounded corners of finest maple wood Removable Sela Snare System Individually adjustable snare sound Special Clap Corner sound High-quality parts, “Made in Germany” Nonslip Rubber Feet. 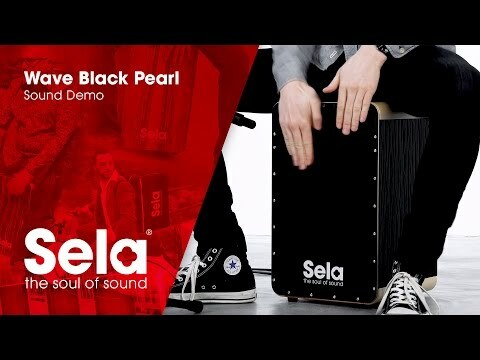 Do you own Sela Wave Black Pearl or have you had a chance to try it?